Need a study break? Feel like you’re missing out on free snacks? In desperate need of basic human interaction? EHA is here to help! Edgerton Coffee Hour Study Break Snack Time Extravaganza: Winter Edition is here and the name is even longer. There will be coffee and tea (caffeinated or decaf as your study habits require), healthy and unhealthy snacks for a balanced diet, and fellow Edgertonians. An afternoon of artistic activities in the Edgerton large lounge! 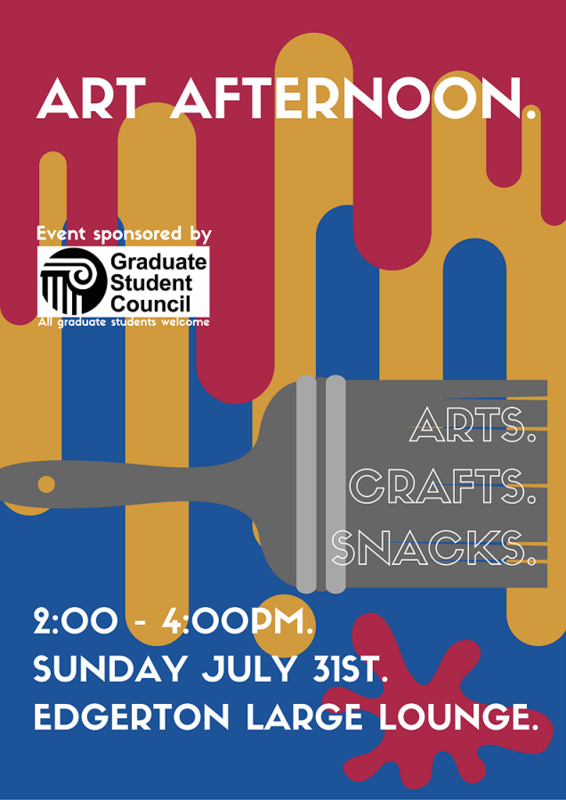 Grad students come together to relax, socialise and enjoy some fun arts and crafts. Activities offered include personalising a mug to take away and brighten up your tea/coffee break, painting a small canvas to display at home, or mastering some cool origami sculptures. We’ll also supply you with snacks and drinks to keep your creative juices flowing! 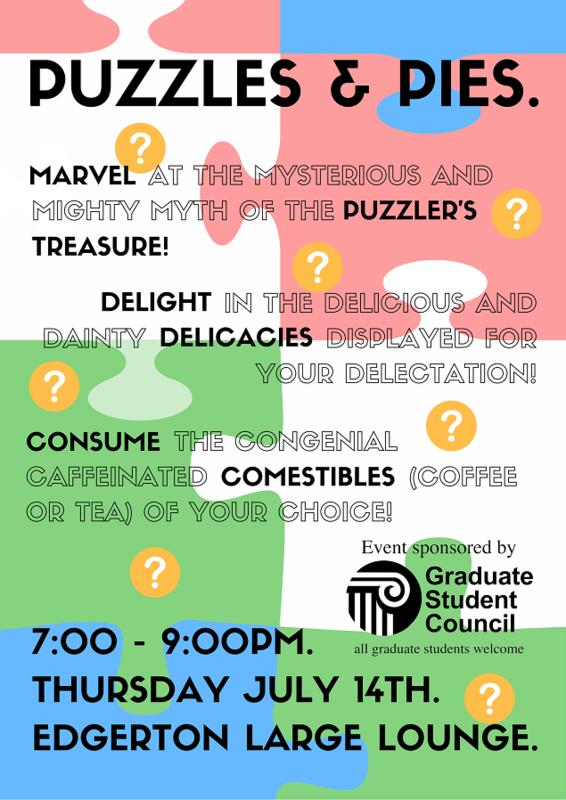 Sponsored by the Graduate Student Council, so all graduate students are welcome, not just Edgertonians! Come with your friends to eat pie, solve puzzles, and drink coffee / tea. Bond over the appetizers and the puzzle-solving experience! 1) Given 200 toothpicks and 40 gumdrops, build a tiny bridge in 30 minutes. Prizes awarded to teams with (A) longest bridge, (B) tallest bridge and (C) bridge that holds the most weight. 2) Given 10 sheets of letter-size paper and a 12″ piece of masking tape, build the tallest free-standing structure you & your friends can in 30 minutes. 3) Jigsaw (100 pieces). First team to complete gets the prestigious and mysterious PUZZLER’S TREASURE for keeps. Second team gets an ordinary, boring, prize. Third team gets a joke prize (although the other prizes are kind of jokes too). Tickets are free but limited — register for the event here. This event has been awesomely supported by the GSC Funding Board, OneMIT, ASA LEF, and the MIT Division for Student Life. Need caffeine? Need a study break? Need basic human interaction? We can supply all of the above! 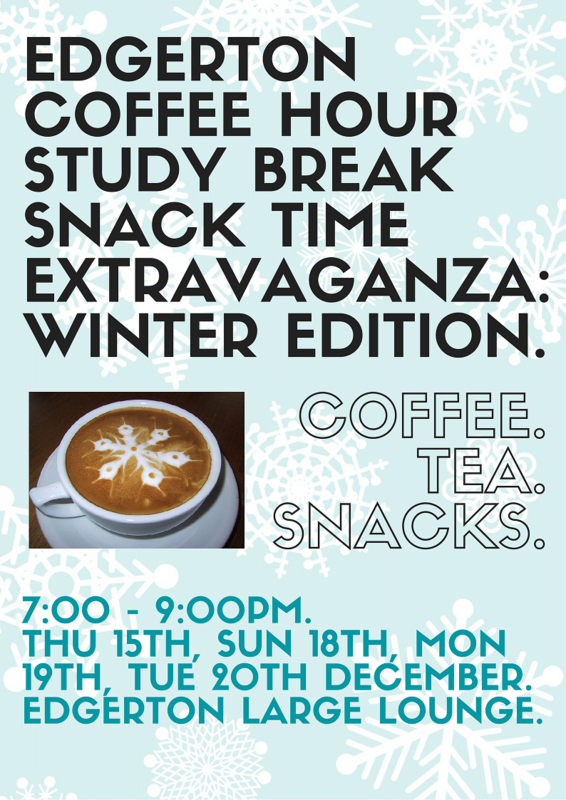 Next week, when you’re tired of studying for finals, take a break and come to the shiny new Edgerton Coffee Hour Study Break Snack Time Extravaganza. There’ll be coffee and tea (both caffeinated and decaf options to fulfil either your all-nighter OR healthful rest needs), healthy AND unhealthy snacks (a balanced diet is vital after all) and most importantly, friends to procrastinate with. Or study with, I guess: your call. 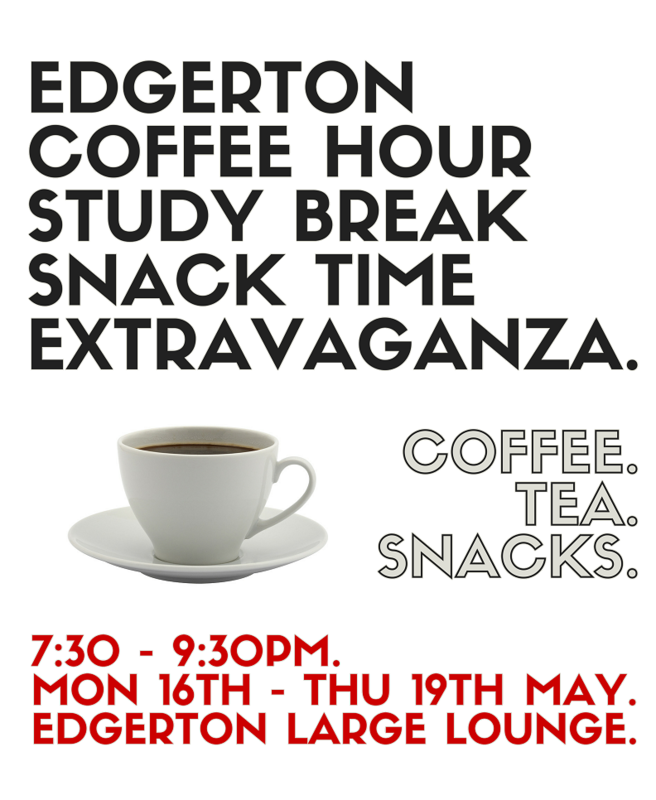 It’ll be held every evening Monday 16th to Thursday 19th May, from 7:30-9:30pm in the large lounge. That’s four whole coffee breaks. You know we spoil you. We’ll even put out different snacks throughout the week to avoid losing any of the sparkling novelty. It’s time for our “Bi-weekly” social again. There will be food ( probably Chinese from the Royal East ) and maybe some other fun surprises depending on the weather so make sure to stop by! As always you are encouraged to help save the environment by bringing your own forks and plates. There won’t actually be fishes. Apologies to the fish enthusiasts. You should bring your own forks, plates & utensils though. The food will be Mediterranean / Middle Eastern, fresh from Pita: http://www.yelp.com/biz/pita-boston-5. If you have dietary restrictions, please alert me to them and I’ll modify the order accordingly. This event is happening Sun 4/10 7pm, in the Edgerton large lounge. It’s the start of a new school year, and Edgerton has many events for residents old and new! Featuring free food and a special guest, Libby Mahaffy, who will talk to residents about roommate conflict resolution. Ashdown and Edgerton will be hosting an IKEA outing next week Wednesday (August 27th) at 10:30 am by4:30pm. Tickets will cost 5 dollars and can be purchased at the GSC information booth next week. The buses leave from Edgerton and there will be return stops at Edgerton, Ashdown and Sidpac. This is a great opportunity to pick up all those dorm essentials you have been missing and enjoy some great swedish food! Come meet the House Staff over a delicious breakfast! Please RSVP your attendance at the Front Desk by August 29. Watch the FIFA World Cup! 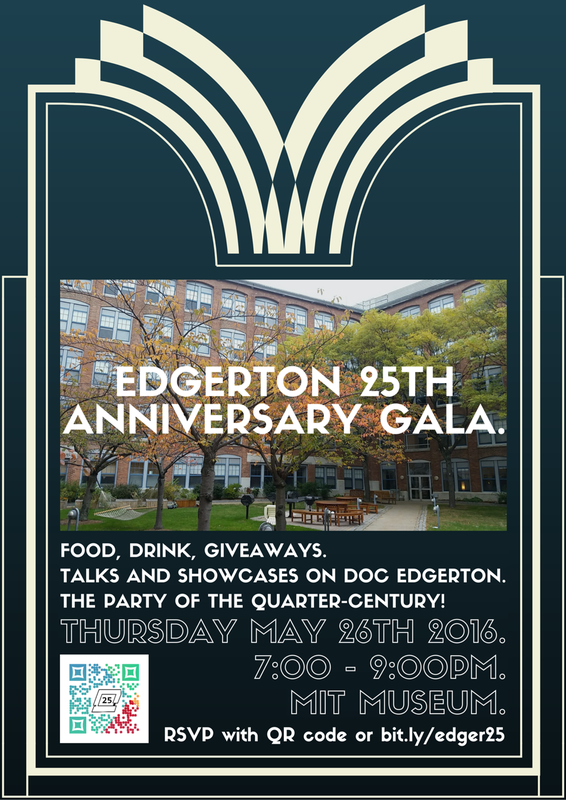 Come celebrate the START of summer and the END of finals at Edgerton House this Memorial day ! There will be BBQed deliciousness (grilled chicken, sausages, burgers, burgers and burgers! ), other tasty treats, some sweet tunes, the excellent company of peers and possibly impromptu ball games! Please bring your own plates and utensils. You can help us reduce waste and claim extra food if you bring your own plate.